Bluetooth is one of the standards that's become the most popular, especially for audio. If you're looking to upgrade your TV speakers to connect to your TV without long wires, it's only natural to consider a Bluetooth TV setup. We'll cover what you need and how to add Bluetooth to a TV, as well as explore a few of the obstacles and better alternatives. Before you get too deep into this process, you'll want to know what options your TV can support. The first thing to do is check to see whether your TV already has Bluetooth built in. Some TVs have this, and if yours does, you may not need fancy adapters. If you have a Bluetooth-enabled TV and are connecting to speakers or headphones that don't use Bluetooth, you can use a Bluetooth receiver like this Harmon Kardon Bluetooth adapter. If you're ready with Bluetooth-enabled devices, you can jump straight into connecting to your TV using Bluetooth. The other important thing to note is the various audio output options your TV supports. If it doesn't have built-in Bluetooth, you'll likely be relying on a 3.5mm AUX, RCA, or optical audio output. You'll need to confirm which ports are available to you when picking an audio solution so you get one that'll work with your TV. 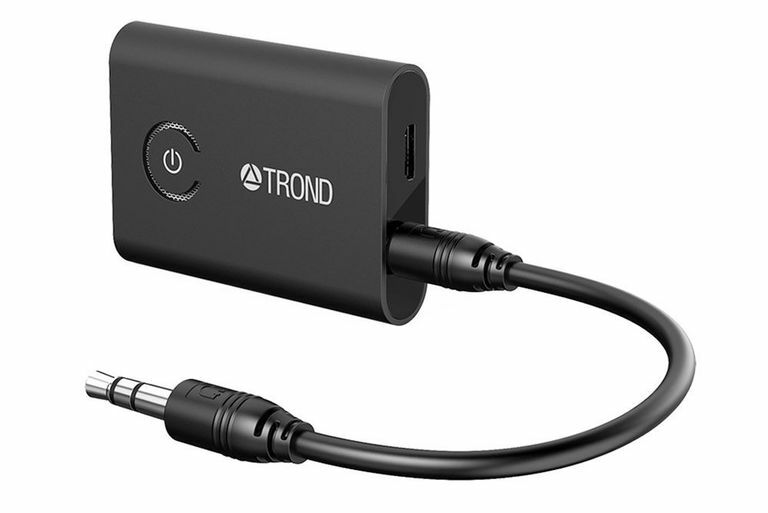 Audio Sync: Many Bluetooth TV adapters will support a limited number of devices at a time. Some support two pairs of headphones, so you and someone else can listen at the same time. While you could use this feature to try setting up two Bluetooth speakers, you may run into issues with the audio being out of sync, and you may not get a proper stereo sound unless the speakers are designed to work together specifically for that purpose. Audio Quality: Audio quality over Bluetooth is generally not as good as other solutions, like wired connections or other wireless audio types. How much quality is lost depends on the Bluetooth codecs supported both on the transmitting and receiving ends. See What to Know About Bluetooth to learn more about Bluetooth and audio quality. Latency: Depending on the devices you use, there could be significant latency, meaning the audio you hear may lag behind the imagery on TV. Wiring: If you're thinking of using Bluetooth because you want to avoid lots of wires, it's also worth noting you'll likely be wiring a Bluetooth transmitter from the back of your TV to somewhere around it where its signal isn't blocked by the TV. In other words, you'll still be dealing with wires. With all that in mind, you may consider something like a soundbar to upgrade your audio setup while also supporting a completely wireless surround sound setup with a seamless connection to remote TV speakers. Or, you have the option of using a device like a Roku streaming player, many of which support wireless audio when a pair of headphones is plugged into the remote control. If you've settled on adding a Bluetooth transmitter to your TV to handle wireless audio from your TV to a pair of headphones or speakers, the basics are fairly simple. You'll want to start by getting a Bluetooth transmitter that'll work with your TV. Something like Avantree's Audikast is a versatile option, as it can transmit to two devices simultaneously, supports low latency audio, and can take audio inputs from USB, optical, RCA, and 3.5mm AUX outputs on your TV or computer monitor. You can also find simpler and cheaper transmitters that use 3.5mm jacks, like Trond's transmitter. In most cases, you'll need to connect the transmitter to a power source unless it has its own battery. Then you'll have to connect it to one of your TV's audio outputs. To pair Bluetooth headphones or speakers, you'll want to put them close to the transmitter and set each device to pairing mode. Activating pairing mode will be different for each device, so be sure to check the specific instructions included with your transmitter, speaker, or headphones. Once paired, you're ready to listen. You may need to unplug the adapter to resume using your TV's built-in speakers, though this depends on your TV and which audio port you use. It really is that simple to set up, but getting a good experience out of a Bluetooth adapter for your TV can be more complicated. Tom's Guide has a number of recommended adapters that may help you get a higher quality, latency-free experience.